Mr. Giustra is CEO of the Fiore Group, a private firm managing a broad portfolio of private equity investments and companies, specializing in food and lifestyle, art and entertainment, and has a proven track-record in financing and building natural resource companies. Mr. Giustra’s entrepreneurial success includes founding Lionsgate Entertainment, now one of the world’s largest independent film companies. Mr. Giustra brings an entrepreneurial approach to philanthropy to catalyze new ideas and innovations that can be scaled and shared. Through his family foundation – the Giustra Foundation – he devotes his time to a variety of causes on a local and global level. Most recently, he has been a champion for refugees through advocacy and philanthropy and has been actively involved in the global refugee crisis by providing humanitarian aid in Greece along with being a founding partner in The Ascend Collaborative. The Giustra Foundation is also a founding partner in the Global Refugee Sponsorship Initiative (GRSI) — along with the Government of Canada, UNHCR, Open Society Foundations and the University of Ottawa Refugee Hub. GRSI’s mandate is to export and implement Canadian’s successful private sponsorship model to countries around the world – a model that allows private citizens to adopt refugees. 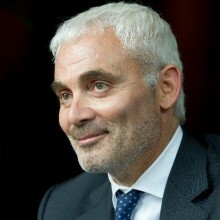 Mr. Giustra is well known for working with former President Bill Clinton to launched the Clinton Giustra Enterprise Partnership in 2007, recently renamed as Elevate Social Businesses (Elevate). Elevate is a social business builder that brings entrepreneurial solutions to global poverty and operates enterprises in Colombia, El Salvador, Haiti, and Indonesia.